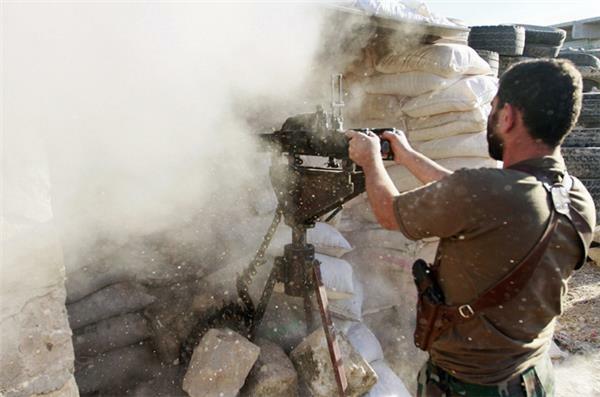 Syrian rebel fighter fires towards the village of Aziza, which is under the control of forces loyal to Syria's President Bashar al-Assad, in the southern countryside of Aleppo. Iran has allowed Syria's regime to station fighter jets on its territory to keep them safe from foreign attack, German intelligence services believe according to a media report on Sunday. News portal Spiegel Online said the report, marked "classified", pointed to close military ties between Damascus and Tehran beyond the deployment of Iran-backed Hezbollah militia on the side of regime forces. The German intelligence paper reportedly said Iran had also sent elite troops from its Revolutionary Guard to support the forces of Syrian President Bashar al-Assad. The intelligence report also said a source had reported that a Syria-Iran military deal from November 2012 allowed Assad "to station large parts of his air force on safe Iranian territory and to use them when needed," said Spiegel Online. A team of disarmament inspectors in Syria have begun the process of destroying the country's chemical weapons and production facilities, news reports say. certain Geneva peace talks will take place mid-November. Disarmament experts backed by the United Nations have begun the process of destroying Syria's chemical weapons. The Organisation for the Prohibition of Chemical Weapons said on Monday that Syria's government was being "cooperative" in the operation to destroy the country's arsenal of the banned weapons. In a statement posted on its website, the OPCW said an advance team that accompanied inspectors to Damascus last Tuesday was returning to the Hague after meetings with Syrian authorities. "Discussions were held with the Syrian authorities on the disclosure which Syria earlier provided to the OPCW on its chemical weapons programme," the statement said. "The discussions were constructive and the Syrian authorities were cooperative." A joint UN-OPCW team arrived in Damascus last week to begin verifying the information and destroying arms and production facilities. Damascus must submit by October 27 its plans for the destruction of all its chemical weapons and facilities, which will then be used to draw up "destruction milestones". Syrian government forces have continued to shell civilian areas of Damascus, anti-government activists claimed on Monday. Video footage uploaded to YouTube over the past 48 hours showed burning buildings in the district of Dariya and government forces firing shells in the suburb of Moadamiyeh. The violence came as US Secretary of State John Kerry praised Syrian President Bashar Assad's co-operation in dismantling his chemical weapons arsenal. The Syrian chemical weapons programme began to be dismantled on Sunday, according to an international team tasked with overseeing the effort. The conflict, which is rooted in what began as peaceful protests in March 2011, has laid waste to the countries' cities, shattered its economy and driven more than two million people to seek shelter abroad. In a letter to the UN body, the Secretary-General suggested that approximately 100 experts form a Joint Mission from representatives of both the OPCW and the UN. The Joint Mission will be deployed to Syria from their headquarters in Cyprus in a dangerous mission to oversee the "complete elimination of Syrian chemical weapons material and equipment by the first half of 2014," he wrote in the letter on Monday, adding that "the Joint Mission will seek to conduct an operation the likes of which, quite simply, have never been tried before." Phase I: To "establish an initial presence in Damascus and develop an initial operating capability". The Joint advance team has already begun some of these activities. Phase II: Through November 1, OPCW must complete initial inspections and "oversee the destruction by [Syria] of all chemical weapons production and mixing and filling equipment. Phase III: What Ban termed the "most difficult and challenging phase," would entail from November 1 2013-June 30 2014 the Joint Mission "to support, monitor and verify the destruction of a complex chemical weapons programme involving multiple sites spread over a country engulfed in violent conflict", including "approximately 1,000 metric tons" of chemical weapons material. As neither the UN nor the OPCW is mandated to conduct actual destruction activities, "it is highly probable" that member states will have to help in the form of technical, operational or security assistance. Ban noted that the time frame is "ambitious under the most peaceful and benign of circumstances," and expressed his desire for the UN to make investments in safety to provide the "highest possible level of safety and security" for the Joint Mission personnel. There has been a rebel attempt to take over a government military base in Northern Syria. Diplomatic momentum is building to bring Syria's warring parties together for peace talks, but with Bashar al-Assad in no mood for concessions and his opponents still deeply divided there is little prospect for an early end to the catastrophic civil war. Hopes that the long-delayed talks may finally go ahead in Geneva next month have been boosted by the rare sight of Washington and Moscow cooperating to eliminate Syria's chemical weapons and hints of a US thaw with Assad's ally Iran. President Vladimir Putin said on Tuesday that Russia and the United States had a common understanding on disarming Syria's chemical arsenal - a sharp change in language about a 2-1/2 year conflict which has revived Cold War antagonisms. Iran rejects any conditions for taking part in a long-delayed peace conference on Syria, Iranian media reported, in effect dismissing a US suggestion that Tehran back a call for a transitional government in Damascus. The US State Department said on Monday Washington would be open to Iran taking part in a "Geneva 2" conference seeking an end to the war if Iran publicly supported a 2012 statement calling for a transitional authority to rule Syria. But Iran rejected any conditions being placed on it to participate in diplomatic efforts on Syria, Foreign Ministry spokeswoman Marzieh Afkham said on Tuesday evening. "If our participation is in the interest of achieving a solution, it will be unacceptable to set conditions for inviting the Islamic Republic of Iran, and we accept no conditions," Afkham said, according to the state-run Press TV. 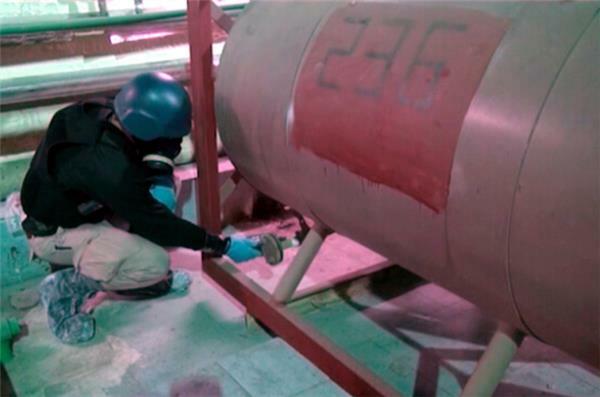 UN disarmament inspectors continue to dismantle Syria's chemical weapons arsenal. The OPCW team embarked on their field work on October 6 after a series of meetings with Syrian government officials. The government's chemical arsenal is to be completely eliminated by mid-2014, under a US-Russian disarmament plan backed by a UN Security Council resolution. The UN Security Council has formally approved a first joint mission with the Organisation for the Prohibition of Chemical Weapons to destroy Syria's weapons on Friday. 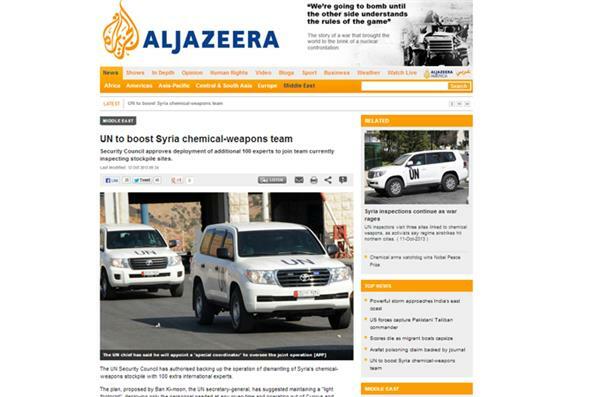 The UN and OPCW have a team of 60 experts and support staff in Syria destroying chemical production facilities. The 15-member Security Council sent a letter to Ban on Friday backing his plan to fully eradication of Syria's banned chemical arms. Ban was to name Sigrid Kaag of the Netherlands as head of the joint mission, UN sources told AFP news agency. Kaag is a UN assistant secretary general working at the UN Development Program. "This recognition occurs nearly 100 years after the first chemical attack -- and 50 days after the appalling use of chemical weapons in Syria. Far from being a relic of the past, chemical weapons remain a clear and present danger," Ban said. Ban said in a draft plan sent to the Security Council that up to 100 experts will be needed to destroy Syria's sarin, mustard gas and other chemical weapons by the middle of 2014. The mission will have bases in Damascus and Cyprus, where most inspectors will stay unless they are on site visits. Syria's state news agency says two mortar rounds struck an upscale neighborhood in the Syrian capital of Damascus, killing a child and injuring 11 people. The Abu Roumaneh area where the mortars struck on Saturday is several hundred metres from a hotel where international inspectors are based during their mission to destroy Syria's chemical weapons. 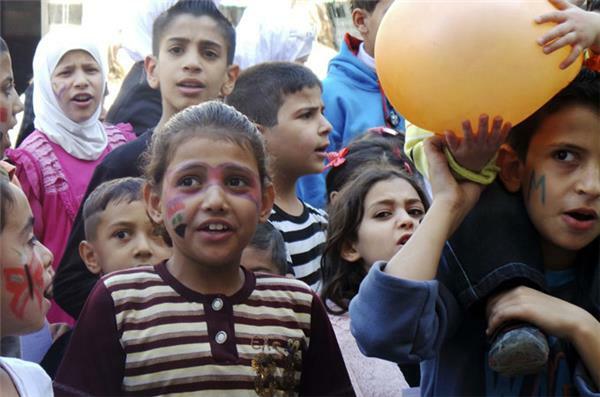 The SANA agency says one shell hit near a school and the other on the roof of a building. It says the child killed in the attack was eight years old and that the shells damaged several shops and cars. Syria maintains its spending in 2014 budget despite heavy war losses. The government has agreed to a 8.18bn budget, Reuters reports citing Syria's state news agency SANA. This is a small increase in spending despite the financial devastation wrought by more than two years of civil war. Could the unintended consequences of the Syrian uprising prove a cautionary tale for other aspiring revolutionaries around the world? An interesting analysis over on our main site. And don't forget the in depth coverage on our Syria spotlight page. Syria's Red Crescent said on Sunday it has evacuated at least 1,500 people since yesterday from a Damascus suburb that has been under siege by the Syrian army for months. Syrian rebels say they have shot a government warplane near the the southern city of Deraa along the border with Jordan, but the plane was able to make an emergency landing, Reuters has reported. The fighter jet, is the second to hit this month in the same area. There are no reports of the incident on Syrian state media. Rebels in southern Syria do not have sophisticated anti-aircraft abilities and have complained they are not getting advanced weapons that could strengthen their hand against the superior firepower of President Bashar al-Assad's armed forces. 7 of our colleagues have been abducted in northwest #Syria . We call for their immediate release. Breaking from AP news agency: A Syrian state-run TV station says 2 car bombs have exploded in central Damascus. More as we get it. Syria's official news agency says two bombs have exploded near the state television building in central Damascus, Sunday. 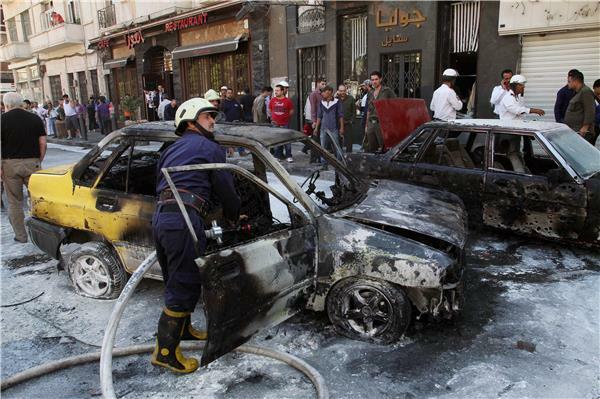 AFP reports the two car explosion was a suicide bomb attack that blew up in the centre of Damascus. Three of the kidnapped Red Cross aid workers and Red Crescent volunteer have been freed in Syria, the International Committee of the Red Cross (ICRC) reported. Two Turkish pilots kidnapped in Beirut in August were shown in a video broadcast by Lebanese television channel LBC on Tuesday, saying they wished they could be at home. Murat Akpinar and Murat Agca, both Turkish Airlines employees who were kidnapped on Beirut's airport road on August 9, appeared in good health but pale and nervous. Both said they were well, but wanted to be with their families for Eid al-Adha, the Muslim holiday that began on Tuesday in most of the Islamic world. "My name is Murat Akpinar, today is 14th October 2013, there is only one day before Bayram (Eid). I would like to be at my home. I am fine," Akpinar said. "My name is Murat Agca. Today is the 14th of October, which is the day before Bayram," Agca added afterwards. Syrian warplanes bombed several rebel-held areas on Tuesday and opposition fighters fired mortar rounds and homemade rockets at Damascus on the first day of a major Muslim holiday, activists said. The fighting during Eid al-Adha, or the Feast of Sacrifice, showed how entrenched both sides have become in Syria's civil war, now in its third year. Previously, combatants occasionally attempted to observe holiday cease-fires. None of Syria's chemical weapons sites are under rebel control, the key opposition National Coalition said on Tuesday. The assertion came after the head of the Organisation for the Prohibition of Chemical Weapons said one abandoned site was in a rebel-held area and that inspectors from a UN-OPCW team were hoping to visit it. In a statement, the Syrian National Coalition opposition grouping said it backed the UN-OPCW mission but insisted none of the weapons sites were under rebel control. "There are chemical sites under regime control that Free Syrian Army brigades are laying siege to but there are no chemical sites at all that are controlled by the rebel brigades," the Coalition said. The statement said the Coalition and rebel command sought "full cooperation with all international missions to facilitate their work and ensure their full protection". A general director of Doctors Without Borders is calling for greater access for humanitarian aid in Syria to help people affected by the country's civil war. Christopher Stokes also urged the international community to show the same urgency to secure access for such assistance as it did to rid Syria of its chemical weapons. Stokes said the recent access granted to weapons inspectors proves areas that have long been sealed-off can be opened if the political will exists. Doctors Without Borders currently operates four clinics in opposition-held areas, and clandestinely supports 70 in government-controlled territory. Stokes said Tuesday that the government has not authorised the group to work in Syria. Turkish Army fired at al-Qaeda bases in Northern Syria. shell which struck Turkish territory. from the North Storm Brigade crossed the border and surrendered. They laid down their arms at the border police department. Sky News Arabia says that it has lost contact with its team of reporters in the contested city of Aleppo in northern Syria. request have been missing since Tuesday morning. have been locked in a bloody battle since mid-2012. Syrian Deputy Prime Minister Qadri Jamil said on Thursday that a long-delayed international conference aimed to bring the Syrian government and opposition together to seek an end to the country's civil war is scheduled to be held Nov. 23-24. Jamil named the dates when he was asked at a news conference in Moscow whether plans for the "Geneva 2" conference, which Russia and the United States have been trying to organise since May, had been pushed back from mid-November to late November or December. #Syria Deputy Prime Minister Qadri Jamil said Geneva 2 conference scheduled to be held Nov. 23-24. A top Syrian army general has been killed in fighting with rebels, state-run Syrian television reported on Thursday, as the country's deputy prime minister floated November 23-24 as possible dates for talks on a political solution to the conflict. the provincial capital that carries the same name. Jameh was one of the most powerful Syrian army officers in the country and played a major role in Lebanon when Damascus dominated its smaller neighbour. The TV report did not say when Jameh was killed. It said he died "while he was carrying out his mission in defending Syria and its people". The city of Deir el-Zour has witnessed clashes between troops and rebels for more than a year. Chemical inspectors have visited half the facilities to make them inoperable, but face difficulty reaching rebel areas. The Red Cross in Syria on Friday launched a video appeal for the immediate release of three kidnapped staff, warning the aid organisation's ability to help locals would be compromised. "It's a very, very simple appeal. I appeal from my heart in the name of humanity, on behalf of the families to release our colleagues safe and sound and unharmed," says Magne Barth, the head of the Syrian arm of the International Committee of the Red Cross (ICRC), in the video. "It is clear if this situation is not resolved, it will affect negatively the aid we are trying to bring to the Syrian people. "We need safety and security for our staff to be able to reach out, whether it is in the field of water, or health or food to the people who need us," he said. Six aid workers and one Red Crescent volunteer were abducted on October 13 as their convoy drove back to the capital Damascus from delivering medical aid in the northwestern Idlib province. 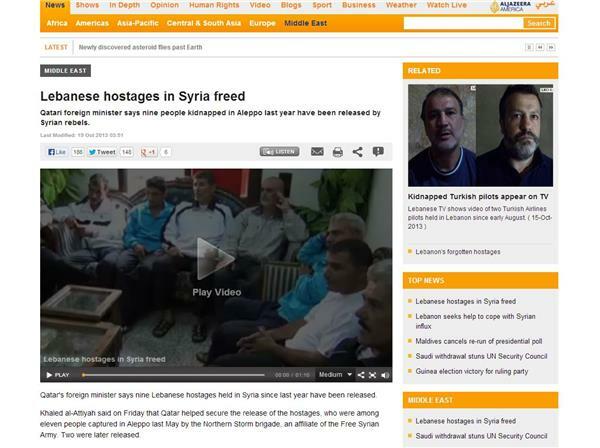 For more on the story about the Lebanese hostages' release click here. A deadly blast has struck a suburb of Damascus with a majority Christian population on Saturday, Syria's state-run SANA news agency reported. The attack was carried out by "terrorists" at the entrance to Jaramana which lies adjacent to the rebel-held town of Mleha, the agency said.